Many of you have probably read the "Fate of the Jedi" series as it is written thus far. There are currently two published books ("Outcast" by Aaron Allston & "Omen" by Christie Golden). Suvudu.com is proud to deliver a FREE e-book, the first in a hopefully long series, in which the stories of the Sith are told during these hard times for force sensitive beings. 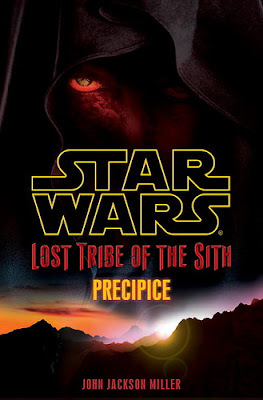 "Star Wars: Lost Tribe of The Sith: Precipice" written by John Jackson Miller, tells the Sith's battle to survive, and their quest to re-conquer the galaxy! They will never stop, even when faced with genocide! This e-book is only 4 chapters long, but it is an excellent addition to the Star Wars "Fate of the Jedi" series and I look forward to many more in the near future! "For the ruthless Sith Order, failure is not an option. It is an offense punishable by death—and a fate to which Commander Yaru Korsin will not succumb. But on a crucial run to deliver troops and precious crystals to a combat hotspot in the Sith's war against the Republic, Korsin and the crew of the mining ship Omen are ambushed by a Jedi starfighter. And when the Sith craft crash-lands, torn and crippled, on a desolate alien planet, the hard-bitten captain finds himself at odds with desperate survivors on the brink of mutiny—and his own vengeful half brother, who's bent on seizing command. No matter the cost, Korsin vows that it will not be his blood and bones left behind on this unknown world. For the way of the Sith leaves little room for compromise—and none for mercy." well, with my kindle I'm in good position to read this. I haven't followed the STar Wars books like I did the Star Trek one. I've only read a couple of the zahn books.